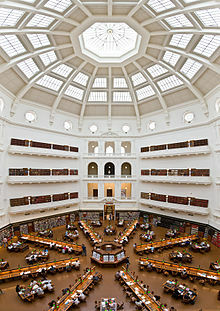 "State Library Victoria". Libraries. National Library of Australia. Retrieved 21 October 2008. ^ Lewis, Miles (Spring 2003). "The Dome". The Latrobe Journal. 72: 58. Archived from the original on 24 March 2015. ^ "Literature, Art and culture, Melbourne, Victoria, Australia". Victoria. State Government of Victoria. Department of Innovation, Industry and Regional Development. Retrieved 15 July 2016. ^ "Winners » ANZIA - Australia & New Zealand Internet Awards". www.anzia.org.au. Retrieved 15 July 2016.